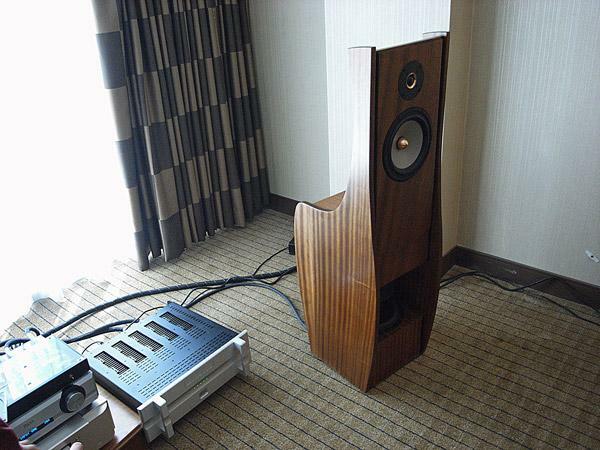 Definitely one of my two best sounds at Axpona, along with the BAT-Scaena room, was the Orion 4 dipole speaker (from $14,750/pair with analog line-level crossover), designed by Siegfried Linkwitz and with custom enclosures made by Wood Artistry. Quad-amped with two Bryston 9B four-channel amplifiers, a Pass Labs preamp, and a Marantz CD player, the "William Tell" section from Shostakovich's Symphony 15 had superb dynamic range, with a "quiet" quality that seemed like there was a lower level of spurious behavior from the room. This allowed a wealth of detail to be perceived even when the music was itself quiet. Each Orion 4 weighs 85 lbs and uses five SEAS drive-units: two soft-dome tweeters, a magnesium-cone midrange unit, and two long-throw 10" woofers especially developed by SEAS for the open-baffle loading used by Linkwitz. The crossover frequencies are 90Hz and 1440Hz and the tweeters, the midrange unit, and each woofer are driven independently, though the woofers can be paralleled to allow tri-amping if only six amplifier channels are available. You can see here the dipole nature of the Orion 4, with the rear-firing tweeter, the back of the midrange unit, and one of the woofers. 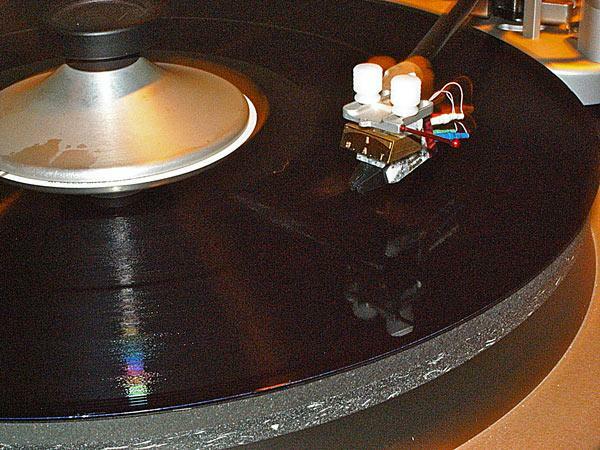 The rest of the system included a Silver Circle Pure Audio 5.0 AC conditioner, Kubula-Sosna Master Reference cables, Critical Mass Systems stands, BAT VK-P10 phono preamp, BAT Rex line stage, Scaena subwoofers, and a Spiral Groove SG-2 turntable and Centroid tonearm. Listening to Marc Cohn's "Riding on a Ghost Train" and Miles Davis's "So What" from LP, it was though I were hearing these familiar pieces for the first time. There was a stability to the high frequencies, a clarity to the midrange, a depth to the low frequencies, that thrilled. Even more surprising was to see John Atkinson on stage, playing a smoking blues riff on the fretless bass. 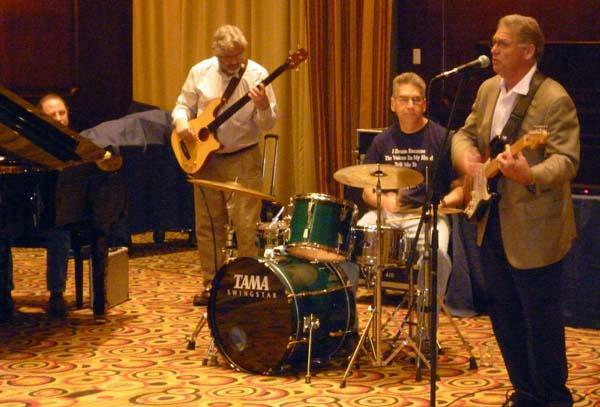 Joining JA were John Yurick on piano, Spiral Groove’s Allen Perkins on drums, and show organizer Steve Davis on guitar and vox. Ready for a beer, JA gave way to Dean Peer on bass, and the band continued to rock and sway, providing the perfect nightcap to a long day. One of the things I like about audio Shows is when they have a full program of fringe events. 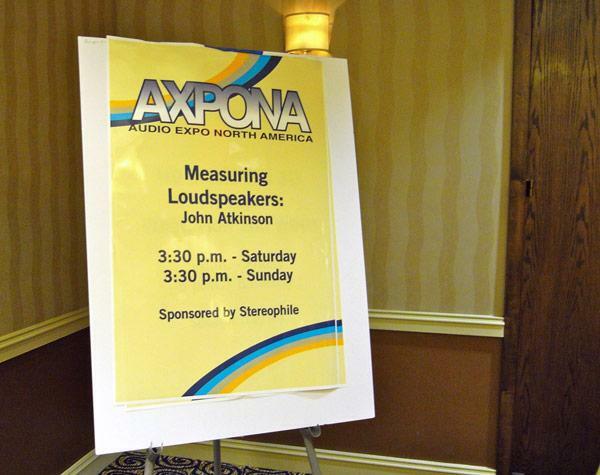 The 2011 Axpona continued this tradition. Not only did Michael Fremer demonstrate how to set up turntables and Dean Peer talk about his experiences as a recording musician, but Channel D's Rob Robinson shows Showgoers how to rip their LPs to their PCs, author Jim Smith explained how to get better sound from your system, Mark Waldrep of AIX Records demonstrated HD music in full surround with 3D video, Enjoy the Music's Steve Rochlin gave talks on the state of the industry, I explained how I measure loudspeakers and what the measurements mean, and Rives Audio's Richard Bird, shown here in action, talked about how best to cope with the acoustics of the listening room. Good, essential stuff. 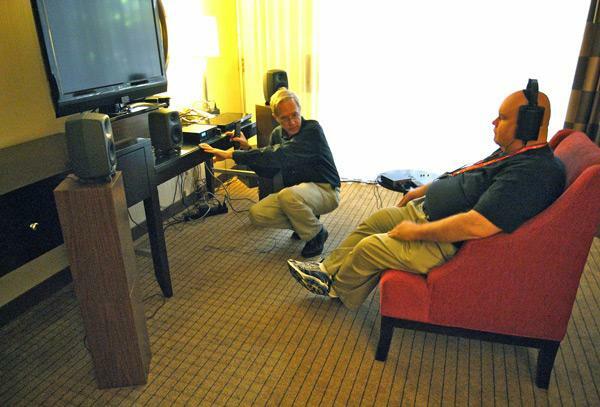 I wasn't surprised to see that Channel D was featuring Joseph Audio Pulsar two-way stand-mount speakers ($7000/pair) in their room. My experience of the Pulsar at Shows is that it offers more bass than you'd expect from its size, with an uncolored, naturally balanced midrange. But I was surprised that it was Jeff Joseph himself, seen here seated at the computer, who was demonstrating Channel D's Pure Music program. (Channel D's Rob Robinson, who was doing the dems of the Pure Vinyl LP-"ripping" program, can be seen standing second from the left.) The rest of the system in this room included. . . 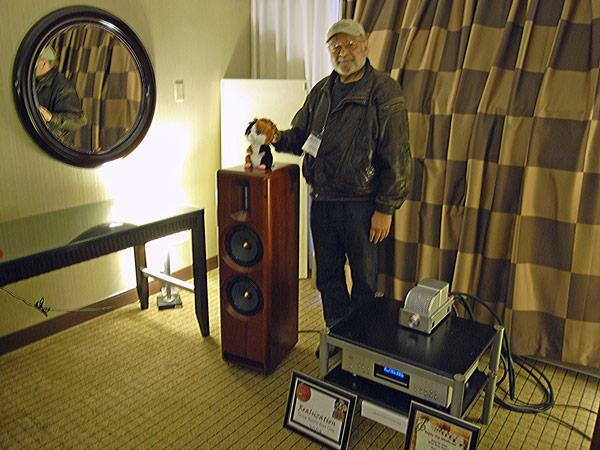 The Kingsound full-range electrostatics have been hits of recent Shows. 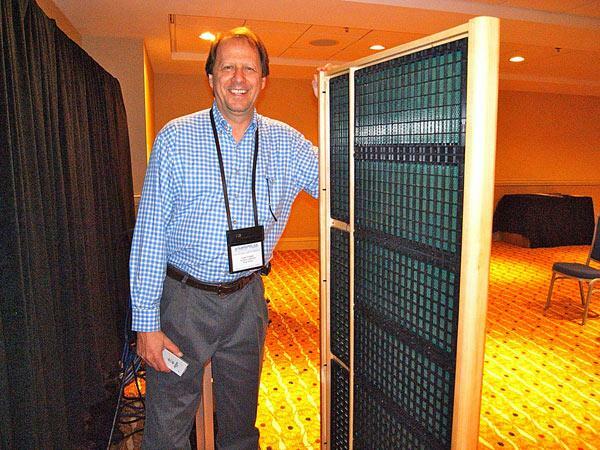 At Axpona, Roger DuNaier was demming the latest version of the King II ($11,500/pair), which was driven by VAC's Statement tube amplification via Cardas Clear cable to great effect on Jane Monheit's "Somewhere Over the Rainbow." Her voice had that palpable presence that you only seem to get with panel speakers. I photographed Roger with the rear of the speaker, so you can see the King II's field-serviceable modular construction. There are seven full-range modules and three narrower tweeter modules and the corssover and HT supply is now housed in a separate enclosure, connected with industrial-quality, secure connectors. 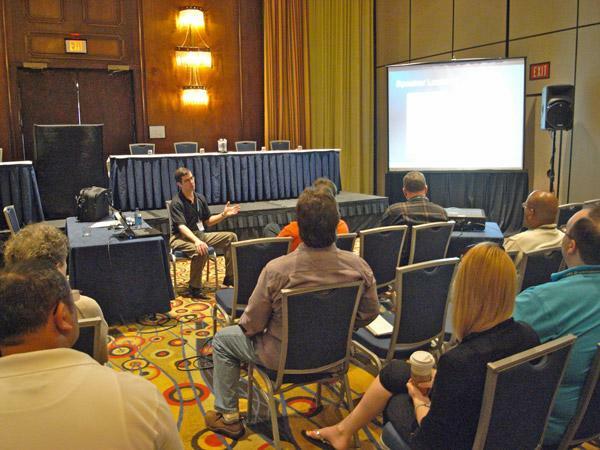 Although in many ways Atlanta's Sheraton Downtown was ideally suited for an audio showmany large rooms; high ceilingsits rambling layout mean that some rooms were hard to find. 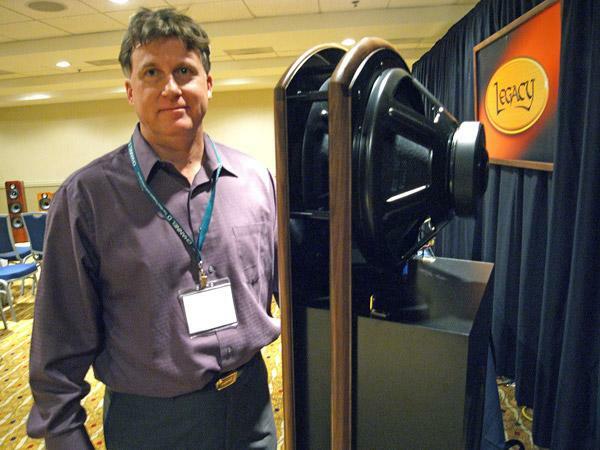 I wouldn't have come across the second-floor room being shared by Carnegie Acoustics and Leon Speakers if I hadn't bumped into Danny Richie (pictured with the CST2 speaker) in an adjacent corridor. 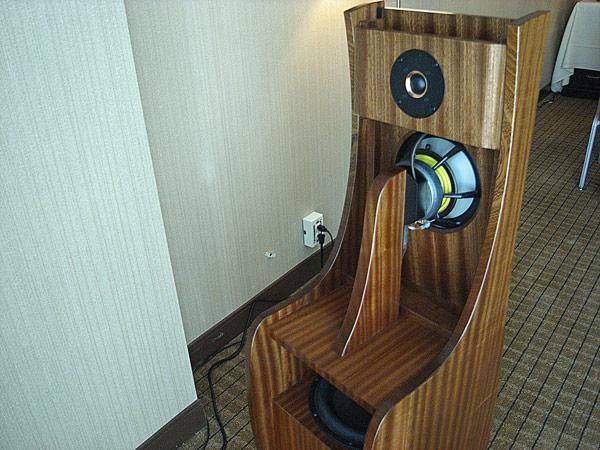 Carnegie had sensibly treated their space with room treatments; the sound of the CST2, which combines eight 5.25" Vipacor-cone woofers with a 1"-by-3" Mylar-fim planar tweeter, driven by a VAC amplifier and a Mach 2-modded Mac mini feeding a Tranquility DAC, was impressively neutral and fullrange on Patrica Barber's "A Test of Honey" from Cafe Blue. 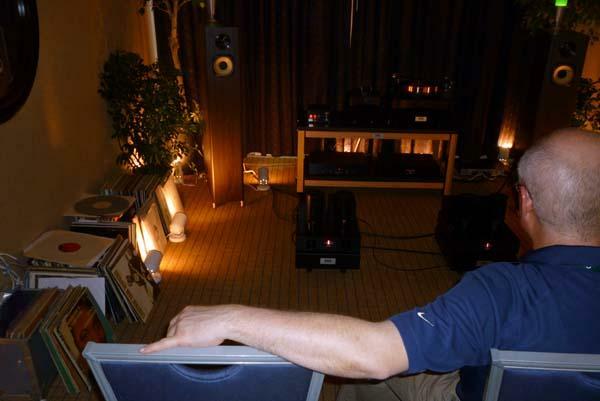 The Smyth SVS Realiser A8 system is a revolutionary product, found Kalman Rubinson in his November 2010 "Music in the Round" column. After the listener has the sound field produced by his system at the entrance to his ear canals analyzed with tiny probe microphones, the Realiser synthesizes that soundfield with Stax electrostatic headphones. The effect is though the listener was not using headphones but listening to his system; and unlike conventional headphone listening, the perceived sound is outside the head and if the listener turns his head, the sound remains centered. Even in surround. 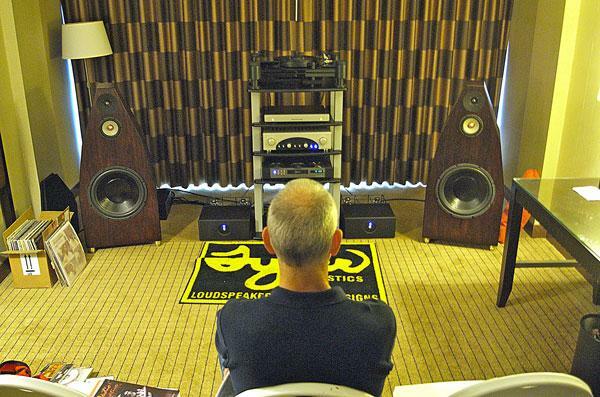 At Axpona, Smyth were subjecting listeners first to a 5.1 system, then calibrating the Realiser for each listener, then allowing them to switch between the real thing and the version produced by the headphones. Everyone I spoke to, including Ivy Johnson shown in the photo, thought the effect amazingly lifelike; my regret was that I did not have time to experience it for myself. 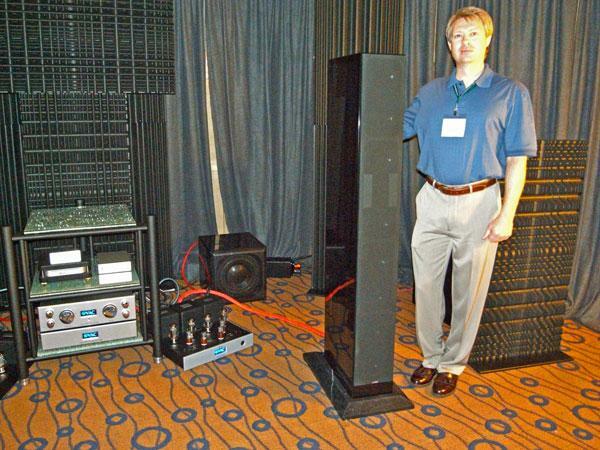 Loudspeakers from Kentucky-based Tyler Acoustics have created a bit of a buzz on the Internet, but Axpona was my first opportunity take a serious listen to them. The lastest version of the Taylo Reference System shown in the photo ($4800/pair) combines a 6" magnesium-cone midrange unit from SEAS with a 1" soft-dome tweeter from Scanspeak and a 15" woofer from Eminence in a sealed enclosure. Crossover frequencies are 150Hz and 2kHz. 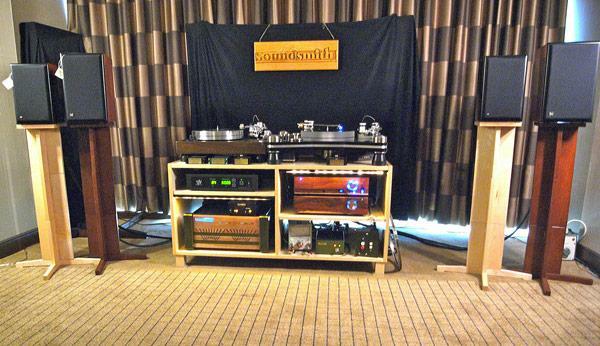 The system featured a Basis turntable, Krell CD player, Sutherland phono preamp, and Rogue preamp and monoblocks, wired with DH Labs cables.